This part explains shortly what pyFormex is and what it is not. It sets the conditions under which you are allowed to use, modify and distribute the program. Next is a list of prerequisite software parts that you need to have installed in order to be able to run this program. We explain how to download and install pyFormex. Finally, you’ll find out what basic knowledge you should have in order to understand the tutorial and succesfully use pyFormex. You probably expect to find here a short definition of what pyFormex is and what it can do for you. I may have to disappoint you: describing the essence of pyFormex in a few lines is not easy to do, because the program can be (and is being) used for very different tasks. So I will give you two answers here: a short one and a long one. The short answer is that pyFormex is a program to generate large structured sets of coordinates by means of subsequent mathematical transformations gathered in a script. If you find this definition too dull, incomprehensible or just not descriptive enough, read on through this section and look at some of the examples in this documentation and on the pyFormex website. You will then probably have a better idea of what pyFormex is. The initial intent of pyFormex was the rapid design of three-dimensional structures with a geometry that can easier be obtained through mathematical description than through interactive generation of its subparts and assemblage thereof. Although the initial development of the program concentrated mostly on wireframe type structures, surface and solid elements have been part of pyFormex right from the beginning. There is already an extensive plugin for working with triangulated surfaces, and pyFormex is increasingly being used to generate solid meshes of structures. Still, many of the examples included with the pyFormex distribution are of wireframe type, and so are most of the examples in the pyFormex tutorial. A good illustration of what pyFormex can do and what it was intended for is the stent  structure in the figure WireStent example. It is one of the many examples provided with pyFormex. Create a nearly planar base module of two crossing wires. The wires have a slight out-of-plane bend, to enable the crossing. Extend the base module with a mirrored and translated copy. Replicate the base module in both directions to create a (nearly planar) rectangular grid. Roll the planar grid into a cylinder. pyFormex provides all the operations needed to define the geometry in this way. pyFormex does not fit into a single category of traditional (mostly commercial) software packages, because it is not being developed as a program with a specific purpose, but rather as a collection of tools and scripts which we needed at some point in our research projects. Many of the tasks for which we now use pyFormex could be done also with some other software package, like a CAD program or a matrix calculation package or a solid modeler/renderer or a finite element pre- and postprocessor. Each of these is probably very well suited for the task it was designed for, but none provides all the features of pyFormex in a single consistent environment, and certainly not as free software. Perhaps the most important feature of pyFormex is that it was primarily intended to be an easy scripting language for creating geometrical models of 3D-structures. The graphical user interface (GUI) was only added as a convenient means to visualize the designed structure. pyFormex can still run without user interface, and this makes it ideal for use in a batch toolchain. Anybody involved in the simulation of the mechanical behavior of materials and structures will testify that most of the work (often 80-90%) goes into the building of the model, not into the simulations itself. Repeatedly building a model for optimization of your structure quickly becomes cumbersome, unless you use a tool like pyFormex, allowing for automated and unattended building of model variants. The author of pyFormex, professor in structural engineering and heavy computer user and programmer since mainframe times, deeply regrets that computing skills of nowadays engineering students are often limited to using graphical interfaces of mostly commercial packages. This greatly limits their skills, because in their way of thinking: ‘If there is no menu item to do some task, then it can not be done!’ The hope to get some of them back into coding has been a stimulus in continuing our work on pyFormex. The strength of the scripting language and the elegance of Python have already attracted many users on this path. This program is free software; you can redistribute it and/or modify it under the terms of the GNU General Public License (GNU GPL), as published by the Free Software Foundation; either version 3 of the License, or (at your option) any later version. The full details of the GNU GPL are available in the GNU GENERAL PUBLIC LICENSE part of the documentation, in the file COPYING included with the distribution, under the Help->License item of the pyFormex Graphical User Interface or from http://www.gnu.org/copyleft/gpl.html. Information on how to obtain and install pyFormex can be found in the Installing pyFormex document. Once you have installed and want to start using pyFormex, you will probably be looking for help on how to do it. If you are new to pyFormex, you should start with the pyFormex tutorial, which will guide you step by step, using short examples, through the basic concepts of Python, NumPy and pyFormex. You have to understand there is a lot to learn at first, but afterwards the rewards will prove to be huge. You can skip the sections on Python and NumPy if you already have some experience with it. If you have used pyFormex before or you are of the adventurous type that does not want to be told where to go and how to do it, skip the tutorial and go directly to the pyFormex user guide. It provides the most thorough information of all aspects of pyFormex. If you get stuck somewhere with using (or installing) pyFormex and you need help, the best way is to go to the pyFormex website and ask for help via the Support tracker. There’s a good change you will get helped quickly there. Remember though that pyFormex is a free and open source software project and its developers are not paid to develop or maintain pyFormex, they just do this because they find pyFormex very helpful in their normal daily activities. 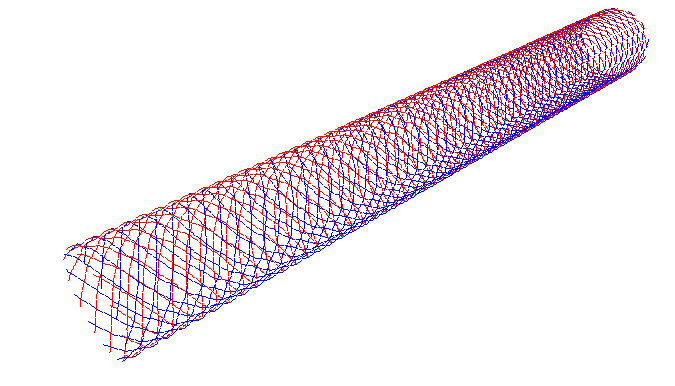 A stent is a tubular structure that is e.g. used to reopen (and keep open) obstructed blood vessels. Third parties may offer pyFormex extensions and/or professional support that are fee-based.